Super Cheap Signs (US & CA) Is Now Live On Affiliate Window! 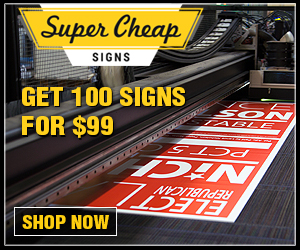 Super Cheap Signs is an online sign company established in 1991. Super Cheap Signs offers customizable yard signs, banners, stickers, car magnets, and other printed materials, plus all the accessories you could need to help you keep your signs in the right place. Want to advertise while sitting in traffic? Make sure to check our our car magnets. Need sidewalk signs, spinner signs, or vehicle lettering? We have all that and much, much more. We provide both screen printing and digital printing services. Shipping is available throughout the US and parts of Canada. Join The Super Cheap Signs Affiliate Program Today! If you have any questions about the affiliate program, please contact Super Cheap Signs program manager at Blakeley.Sears@affiliatewindow.com.